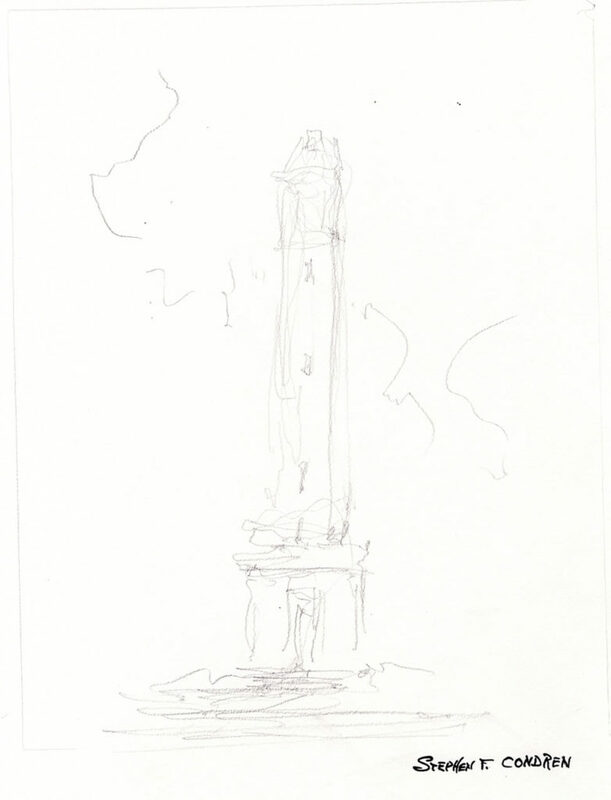 This article is about Denny Chimes #273Z, written by artist Stephen F. Condren, BFA-SAIC, of Condren Galleries, a Fine Arts Gallery ~ the house portrait is done first as a pencil drawing and then a pen & ink, which comes with JPEG & PDF scans for making note cards. Stephen F. Condren was given the Certificate of Special Congressional Recognition by Congressman Bradley S. Schneider. Denny Chimes #273Z prints are for sale here. Denny Chimes is named after the beloved George H. Denny, President of University of Alabama. Dr. Denny had wanted to retire, so as a play to keep him on, the University erected this fine campanile tower to keep him on, and it worked! The pencil drawing was done in two phases. First a light layout sketch to give the proper scope and perspective of the drawing. This drawing had to be done very lightly because it is subject to change. Denny Chines University Of Alabama pencil drawing by artist Stephen F. Condren. The second sketch is really the final draft to get a real feeling of how the drawing will look when the pen & ink is applied. The pen & ink drawing is the last phase of the rendering and as you can clearly see, all of the line work from the preliminary sketches are all in place. Denny Chines University Of Alabama pen & ink drawing by artist Stephen F. Condren. Scans of the pen & ink drawing are available in JPEG & PDF formats. Condren Galleries is pleased to have been to participate in the execution of Denny Chimes #273Z. 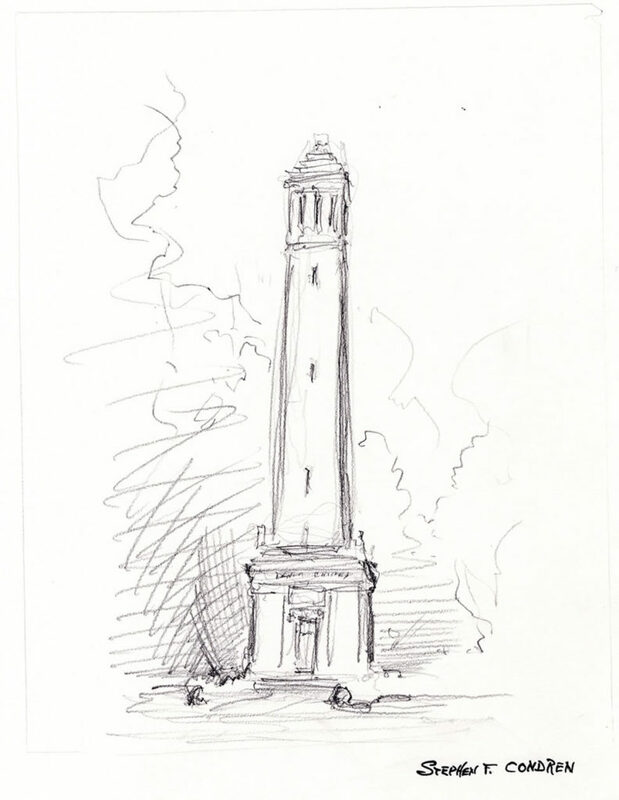 As an artist I have made Denny Chimes #273Z a staple of my architectural rendering works. 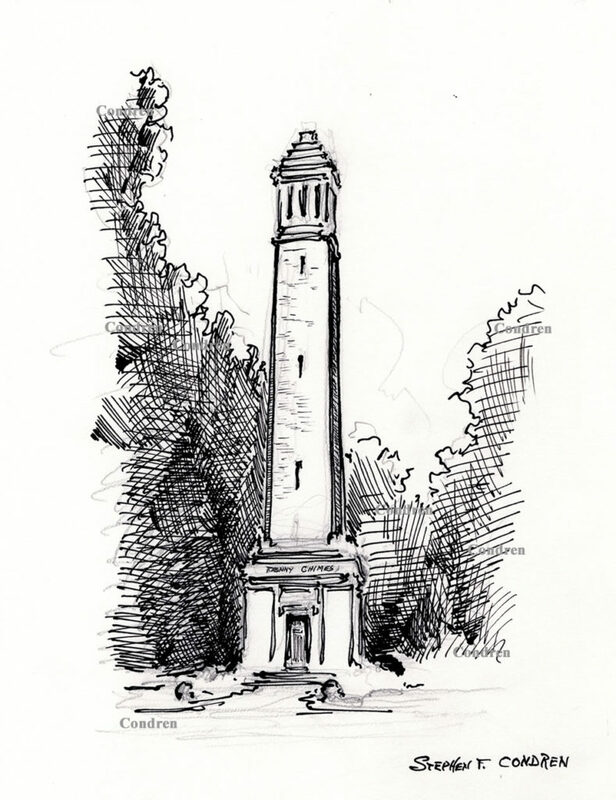 Denny Chimes #273Z pen & ink drawing with prints by Stephen F. Condren at Condren Galleries.